Published on 28th September 2015. Last updated 30th May 2017. “What we are for is equally important as what we are against” was the theme of a large public meeting on 16 September at Nottingham University. 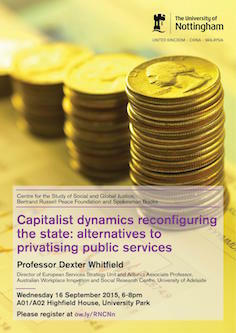 The presentation described the dynamic forces, public sector ‘transformation’ and set out alternative strategies to regenerate public services. The meeting was jointly organized by the Bertrand Russell Peace Foundation, Spokesman Books, the Centre of the Study of Social and Global Justice and University and College Union. Published on 19th September 2015. Last updated 1st June 2017.